Located 20 km. away from the town of Denizli, Pamnkkale is most interesting places in the world. Over the millennia, the calcium-oxide rich waters flowing down the southern slope of Qal Dagi, located north of the ruins, have built up deposits of white travertine on the plateau. These deposits explain both the site’s ancient name, Hierapolis-Holy City-and its modern name, Pamukkale-Cotton Castle. Ancient Hierapolis appears to have been founded by King Eumenes II of Pergamon. Its name is derived from Hiera, the wife of King Telephos, the legendary founder of Pergamon. The city came under Roman control in 133 BC. In 17 BC, during the reign of Tiberius, it suffered a heavy earthquake that substantially destroyed the city, requiring it to be rebuilt. Preliminary excavations at Hierapolis were undertaken by a German team towards the end of the last century whereby since 1957, excavation and restoration work has taken place under the direction of an Italian group of archaeologists. The ancient city was strung out on either side of a long colonnaded avenue called the Plateia. Measuring 13 m. wide, this avenue ran from the gateway in the south to the Arch of Domitian in the north. It was paved with huge blocks of limestone. The first structure one encounters upon reaching the plateau are the city baths, which have been very well preserved. The baths are Roman, and were built in the 2nd century AD. In the eastern part of the baths is a palaestra measuring 36.13 by 52.25 m.. Immediately to the north and south of the palaestra are two large rooms that were reserved for the emperor and for ceremonial use. A large hall, once used by athletes as a gymnasion, stretches the length of the western side of the palaestra. This hall led into the frigidarium from which one proceeded to the barrel-vaulted rooms of the calidarium. A small room adjacent to the large hall now serves as a museum in which artefacts discovered in the Hierapolis excavations are on display. Since Hierapolis was principally a luxurious resort town, it was richly adorned with magnificent sculptures showing the influence of the Aphrodisias school and is well worth a visit. 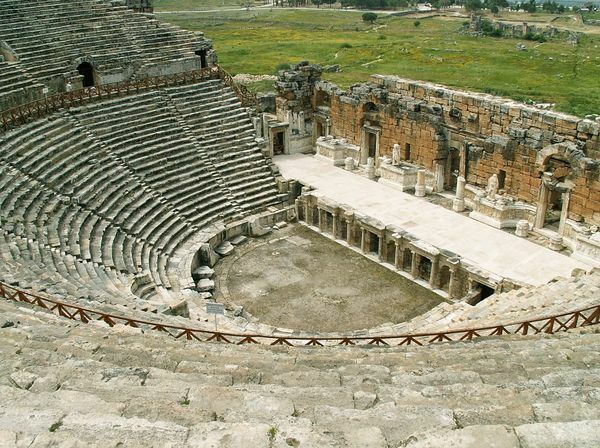 The theater of Hierapolis commands a magnificent view of the plain below. The original theater was located above the northern gate, but when the city was rebuilt during the reign of the Flavian emperors (60 AD) the theater was relocated, though the seats from the old structure were used when it was relocated. During the reign of Septimius Severus (193-211 AD) the theater’s skene was modified and richly decorated with reliefs. In 532 it was discovered that the skene had been weakened by age and the almost daily seismic activity that takes place here, and it was reinforced with pillars.